4. how much redundancy remained as of December 31, 2013. The insurance industry often focuses on media graphics that depict a storm’s path and the “cone of uncertainty,” but many of these graphics fail to explain the physical structure of a hurricane. The extent of hurricane damage doesn’t solely depend on the strength of the storm. It is also greatly influenced by the way the storm makes contact with land, and whether the left or right side of a hurricane strikes a given area. The “right side of the storm” refers to the storm’s motion. For example, if the hurricane is moving to the west, the right side would be to the north of the storm; if the hurricane is moving to the north, the right side would be to the east of the storm. In the Northern Hemisphere, the strongest winds in a hurricane are generally found on the right side of the storm because the motion of the hurricane contributes to its swirling winds. Therefore, the right side of a hurricane packs more punch, since the wind speed and the hurricane’s speed of motion align. Conversely, on the left side, the hurricane’s speed of motion subtracts from the wind speed. The National Hurricane Center (“NHC”) forecasts take this asymmetry into account and often predict that the highest winds are generated on the right side of the storm. The image above illustrates why the strongest winds in a hurricane are typically on the right side of the storm. Hurricane Arthur is now less than 12 hours from impacting the North Carolina coastline, with a forecasted intensity of a strong Category 2 storm. Knowing the exact track of Arthur is critical to predicting the expected damage. If Arthur follows a more easterly track and skirts North Carolina’s Outer Banks, as suggested by the Geophysical Fluid Dynamics Laboratory (“GFDL”) model and current NHC forecast, it would mean the strongest winds (i.e., the right side) would remain away from the Outer Banks and offshore. However, forecast adjustments have been increasingly trending to the west, and with most U.S. models favoring a landfall near Morehead City, NC, the worst possible conditions would hit the Outer Banks as the storm tracks up Pamlico Sound. Above is a view from BMS iVision, which, using model guidance from Verisk Respond, currently puts the right side of the storm and the strongest winds directly over the Outer Banks. This real-time wind forecasting information within iVision will enable clients to view the effect of Hurricane Arthur’s wind swath on their policy base, therefore providing a better estimate of exposed locations and possible losses. This westward track also increases concern for storm surge. The islands of the Outer Banks flood very easily, and the latest forecast by the NHC suggests up to three feet of water over US-64, which is one of two roads crossing the Outer Banks. However, Arthur’s forecasted approach along the North and South Carolina coastlines should limit the impact of a large storm surge. While the Outer Banks is no stranger to hurricane-force winds, or even storms named Arthur (which occurred in both 1996 and 2002), this storm is forecasted to be one of the strongest to impact the area since Hurricane Emily in 1993. With an estimated return period of a hurricane passing within 50 miles of the Outer Banks occurring every five years, property has generally been upgraded to withstand such storms. However, the strongest winds staying to the right side of the current NHC track will determine the final outcome of damage and loss. With a month of the Atlantic hurricane season in the books, one might think that the quiet Atlantic hurricane season is unusual. Historically, however, the year-to-date Atlantic hurricane season typically only experiences an Accumulated Cyclone Energy (ACE) index value of 1, based on the 1981 – 2010 climatology. Also, on average the first named storm typically does not form until the first week in July, with the first hurricane not showing up until mid-August. According to Roger Pielke Jr.’s normalized economic hurricane loss dataset, when looking at damage from tropical cyclones, historically only 2% of hurricane damage occurs in July, with 95% occurring in August and September. In fact, with the development of the first named tropical storm of the 2014 Atlantic hurricane season (Arthur) off the southeast coast of the U.S., the 2014 season is matching nicely with climatology, and by July 4 it should be ahead of climatology. Earlier this spring, in our first look at the 2014 hurricane season, it was mentioned that not all El Niño seasons are the same. Even if an El Niño develops, it does not mean that the Atlantic hurricane season will have limited impact. In that post we highlighted past seasons, such as 2004, where El Niño had a high impact and we further detailed the importance the warmer- than-normal Sea Surface Temperatures (SST) off the East Coast could have on the upcoming season. Arthur is currently centered over these warmer-than-normal SSTs and is expected to strengthen into the first hurricane of the 2014 season. Above is the National Hurricane Center (NHC) official track and intensity forecast, as of 11 AM EDT, showing Arthur tracking along the southeast coast of the U.S. over waters of at least 26 degrees Celsius. This water temperature is warm enough to support hurricane development. According to the NHC, Arthur is expected to just by pass the Outer Banks of North Carolina as a category 1 hurricane on Friday July 4th. Another factor that will aid in hurricane development is the natural curve of the southeast coastline. Historically, the curve of the coastline has helped similar storms develop in this area, by providing a natural pressure/wind gradient that allows for counter-clockwise rotation. In 2004, Hurricane Alex battered the outer banks and strengthened in a 42-hour period from a minimal 35 kts tropical storm to a 85 kts hurricane, as it tapped into the warm waters of the Gulf Stream. Hurricane Alex produced light damage in the Outer Banks, primarily from flooding and high winds. Over 100 houses were damaged and damage totaled approximately $7.5 million (2004 USD) in economic loss. As Arthur develops, an approaching trough of low pressure that is moving into the central U.S. will provide an atmospheric pattern conducive to low pressure development on the southeast side of the trough; this low pressure will allow for further intensification later this week. However, this approaching trough will not only keep the upper Midwest and parts of the East Coast cool for the July 4th holiday weekend, it will likely provide the steering flow to push Arthur off shore and provide minimal impact to insured property along the East Coast. This would be similar to the impact of Alex in 2004. The greatest threat will be to the North Carolina Outer Banks on the 4th of July, as the storm tracks 50 – 100 miles east as a possible strong category 1 hurricane. It has been 1 year, 10 months and 1 day since the last hurricane hit the U.S. (Hurricane Isaac). With the understanding that Superstorm Sandy was officially downgraded miles off the NJ coastline, keep in mind that hurricane Sandy rapidly strengthened, due to a warm gulf stream and Arthur has access to similar warm waters to spur it on. It is these warmer-than-normal SSTs that need to be watched all season. The 2014 Atlantic hurricane season officially begins on June 1. A lot of preseason forecasts are hyping the importance a developing El Niño will have on the overall tropical activity in the Atlantic Basin, which should lead to less storm formation. However, a word of caution: there are plenty of examples of years with El Niños that had significant landfall activity across the U.S. Below is a list of the climate forcers that can influence named storm activity and how they will impact the 2014 season. A weak to moderate El Niño is expected to develop, reducing named storm activity across the main development region in the Atlantic Basin. A westerly to neutral Quasi-Biennial Oscillation will likely result in increased named storm development closer to the U.S. coastline, versus the development of Cape Verde-type storms. Saharan dust can limit overall development of named storms, but conditions across North Africa are not favorable for large Saharan dust outbreaks and should not reduce named storm activity this year, but this climate forcer can change rapidly over the season. Atlantic sea surface temperatures are warmer than the long-term average, but this temperature is slightly below-average relative to the current period of heightened sea surface temperatures that began in the mid-1990s. This will likely reduce activity in the main development region. The sea surface temperatures are significantly above normal along the East Coast, which could increase development of named storms closer to the East Coast, increasing the threat of landfall. The climate forcers above can provide an idea on the overall hurricane season activity, but, truthfully, there is little skill in predicting the total number of named storms and where they might make landfall. The best way for the insurance industry to prepare is to carefully consider the risks and their potential impact. BMS’ new weather risk management module in iVision can help carriers better understand their risk and manage portfolio accumulation in areas prone to hurricanes. iVision also has tools to track forecasted hurricanes, including detailed hurricane wind fields, which can help carriers understand the range of potential loss outcomes from landfalling hurricanes. Learn more about the Hurricane Risk Management Module. When the 2014 hurricane season officially starts on June 1, it will have been 3,142 days since the last Category 3 hurricane made landfall along the U.S coastline (Hurricane Wilma, 2005). This shatters the old record for the longest stretch between U.S. intense hurricanes since 1900. In fact, landfalls in general have been down since 2005, with a rate of 0.75 landfalls occurring per year since 2006, versus the rate of 1.78 that had been experienced since the warming of the Atlantic Multidecadal Oscillation in 1995. Although Superstorm Sandy is still fresh in the minds of many insurers in the Northeast, insurers in hurricane-prone states could become complacent due to the lack of storms since 2005. The “doom and gloom” forecasts for the 2013 hurricane season failed to materialize, and early predictions for 2014 have already hinted at below-normal named storm activity, contributing to such complacency. These Atlantic hurricane forecasts call for hostile conditions across the deep tropics due to the development of an El Niño, which brings increased wind shear across the Main Development Region (MDR) of the Atlantic and could lead to less overall named storm formation. * Cooler and wetter than average conditions in the Southeast U.S. While El Niño years generally have lower instances of named storms that make landfall, there are plenty of examples of El Niño-influenced hurricane seasons that have impacted the U.S. coast. Below is a look at such years, as well as the number of storms that made landfall and the adjusted insured loss in 2014 dollars. As we learned last year, seasonal forecasting has its challenges. Currently, there is a 75% chance of an El Niño developing this summer during the peak of the Atlantic hurricane season. However, in 2012 when an El Niño watch was issued, an El Niño never formed. In fact, since 1997 there have been five threats of a super El Niño that never developed. Therefore, taking into account the uncertainty in any seasonal climate forecast and the history as shown in the chart above, there can be an increased threat from tropical storms even in El Niño years. The 2014 seasonal forecast might also focus on other regional climate forces. One of these forces might be that the Sea Surface Temperatures (SST) off of the Eastern Seaboard of the U.S. are warmer than normal, which not only adds fuel to storms like Superstorm Sandy, but also could lead to deepening of pressures if any tropical disturbances tap into this potential fuel source later this summer. This warmer water also likely means that storms could develop closer to the U.S. coastline. The new seasonal hurricane forecasts, which will roll out around June 1, tend to have increased accuracy as compared to the spring projections. These forecasts will continue to reflect the evolution of the El Niño, which can be followed on the Climate Prediction Center’s website (El Niño/La Niña Current Conditions and Expert Discussions). BMS will also provide updates throughout the season, but expect new seasonal forecasts to call for named storm formation to be below normal for the 2014 Atlantic hurricane season. Although we are approaching the start of May, which is the peak month for thunderstorm development, the 2014 thunderstorm season has been off to a historically slow start. One advantage to this inactivity is that the insurance industry benefits from low thunderstorm losses not seen since 2004. In fact, the insurance industry has reported only $780 million of wind and thunderstorm event losses over three events (with two events yet to be estimated), according to Property Claims Service (PCS). This is far below the $4.6 billion in wind and thunderstorm event losses that have occurred on average over the last 10 years. Not including the tornadoes that have occurred over the last few days as designated in PCS Event #40, the Storm Prediction Center has recorded 109 tornadoes as of April 24 for the 2014 calendar year which, according to BMS’ in-house tornado database from the Storm Prediction Center, indicates that this year is the slowest start to a tornado season in the 62 years of recorded data. Although the recent outbreak of tornadoes will add to the tornado count, the official count will still be in record-low territory. Harold Brooks at the National Severe Storms Laboratory, who has examined nearly 100 years of past tornado records, states that he is “challenged” to find a year that started with less tornado activity than 2014. Of the nearly 100 tornadoes reported this year, only 20 of them had been rated EF1 or higher, with the first EF3 or higher rated tornadoes only recently being recorded with this latest outbreak. This breaks a streak of 159 days, which currently stands as the fourth-longest streak on record between major tornadoes. Despite the massive tornado that carved a swath of damage across Moore, OK during the 2013 tornado season, overall tornado statistics show that the U.S. has been in a tornado drought since the second half of 2012, with a record low number of tornadoes in 2013. Part of the explanation for the drought in intense tornadoes that has occurred since October 2013 is the persistent dip in the jet stream over the eastern half of the nation. This has unlocked the floodgates for arctic air, essentially shutting down the instability that is needed to develop explosive thunderstorms, which are often fueled by heat and moisture from the Gulf of Mexico. The long-term forecast suggests much of the same cold will continue across the North Central Plains into the East Coast through the start of May, which should aid in putting a lid on thunderstorm development. 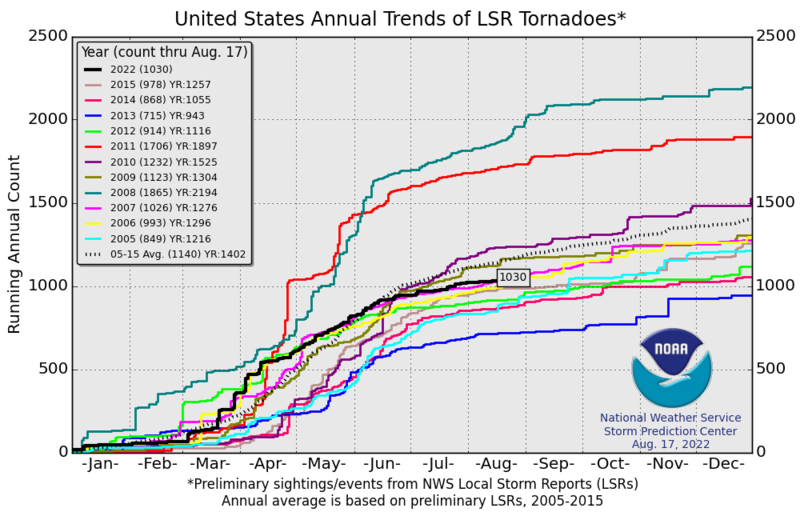 But an extremely quiet start to the tornado season guarantees nothing about its future course, since May and June, which average 116 and 60 tornadoes, respectively (based on records from 2003 – 2013 of EF1-rated tornadoes or greater), are usually the two busiest tornado months of the year in the U.S. Despite the historically slow start, when looking at the tornado data recorded since 1953, 37 of the 62 years, or 59%, have started with below-average tornado counts of EF1 or greater. 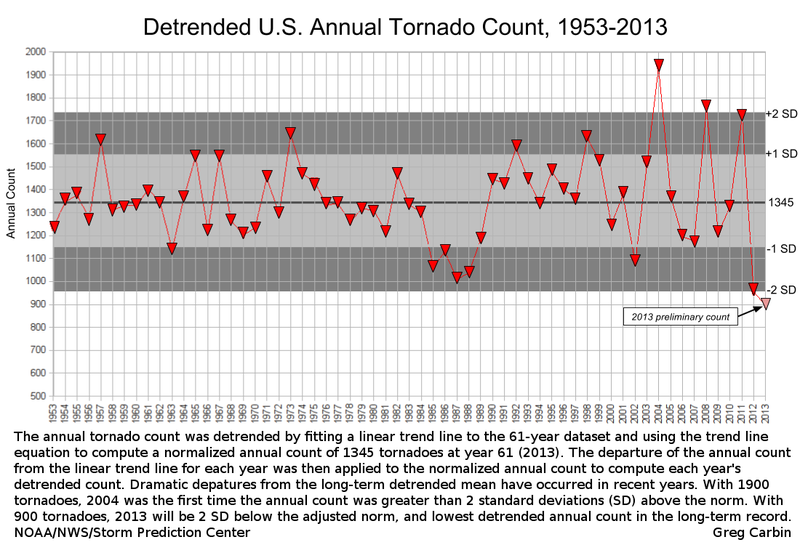 Of the 37 years that started below average, 6 years, or 16%, ended up having an above-average tornado season, The most recent years with slow starts but above-average tornado activity are 2010 and 2004, which resulted in $12.7 billion and $3.5 billion, respectively, in wind and thunderstorm event losses, according to PCS. As we saw with the recent PCS #40 declaration, there will be tornado outbreaks that cause billions of dollars in damages, but a major year like 2011 or 2008 could almost be ruled out and this recent trend should make one rethink the claims of the “new normal” back in 2011. Tags: Andrew J Siffert, Andy Siffert, Meteorologist, Philippines, Reactions Magazine, Super Typhoon Haiyan. BMS’ Chief Actuary Dave Spielger featured in PIAA’s Inside Medical Liability, 4th Quarter edition, discussing the MPL Sector. Reprinted from the fourth Quarter 2013 issue of Inside Medical Liability, Physician Insurers Association of America. Copyright, 2013. Click here to read all about the BMS Analytical Services offering.